What is wrong? Three consecutive regattas now it’s been bikini weather! 24° by Sunday afternoon and a just a light puff of a tailwind. It was Thomas Perkins first regatta and first time in a boat with Pennine’s Jack Civico. A great performance – they were in finals for both 200m and 500m, gaining 2nd for the latter. Thomas also showed great competence in his K1. Kat Burbeck and Imogen Collins were both competing for medals in the Senior Women’s Open and Women U23 respectively and racing K2 together. 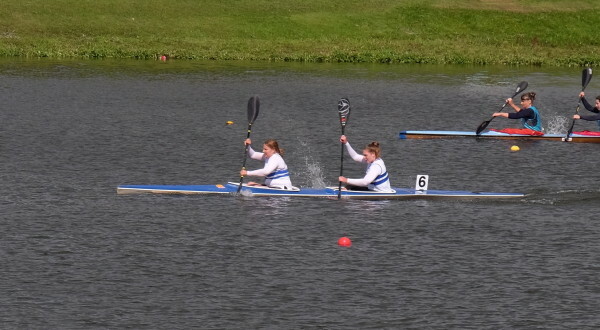 Pretty tough competition, but both were in finals for all races and only just missed out on medals: 5th place with sub 2 mins for 500m K2, and Kat gained 4th in K1 1000m. Indeed, our DW champ managed PBs in all her races. Fred lost his K2 partner last minute to examitus, so he spent all Saturday in the Scottish camp, racing K2s and K4s. First race K2 200m – whoa! – they stormed it, winning it by two boat lengths. 500m K2 was also a great race to watch – sheer grit and determination gained them 3rd place. Good to see Fred back in a K4 too – it’s been a while and he can’t have been too shabby (“it didn’t run too badly” said their rather dour coach) as he’s been asked to join them next regatta, too. Sunday was serious K1 day. Highlight was his favourite 200m Boys A/B and getting into Final A.
July Regatta is round the corner, so get your name up fast! Deadline for sign up is this Sunday 12th June. If you think your sprint racing is a bit rusty, look out on Facebook for some sprint training sessions Immi and Kat plan to put on to sharpen you up. Make sure you keep Interclubs regatta weekend free – 3rd/4th September. We need you! You, too, could share in the sunshine and pleasure of Nottingham Regattas! Can you believe, two regattas in succession and we had minimal wind (bit of a tail in fact) and an abundance of sunshine. We certainly couldn’t. It was the Master’s National Regatta, so we increased our number of racing paddlers by 200% – Fred, Immi plus the four Masters, Brian, Nigel, László and Stefan. Brian and Nigel were up for everything – all three distances in K1 and K2, plus a K4, Stefan almost everything and László, everything but 1000m! Great results, too. 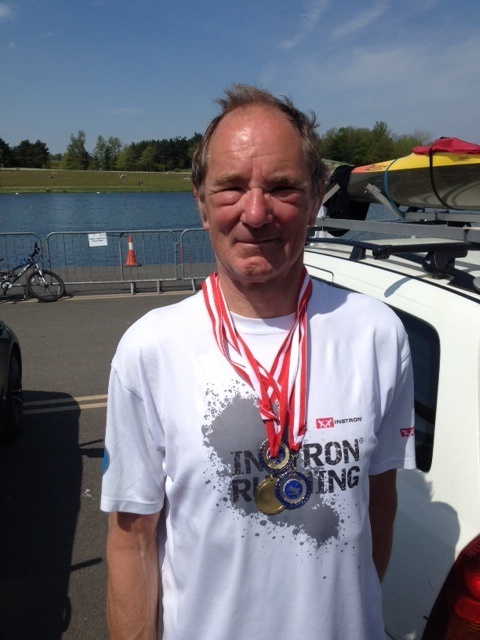 Brian-the-Legend in Over 64 took two Golds and a Silver in his three K1 distances. Nigel in Over 54, with a larger field, went into finals for everything and seemed to gain a fondness for 7th place. Our Over 34s, Stefan and László also succeeded into getting into finals in all but 200m K1, but medals were just out of reach. Immi in Women’s A decided 200m K1 was enough to show willing (! 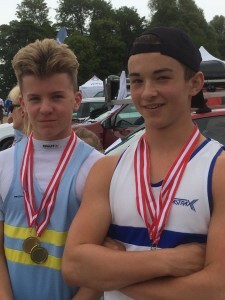 ), yet with ease gained a place in Final B. Fred managed a PB for his 200m K1 42.79 secs, and, after an ok Saturday, woke up on Sunday a re-energised boy and powered through his 500m K1 and K2, gaining a second place in both finals. It was like he and his new paddles had worked things out. If we continue our exponential increase, we should have 18 paddlers signed up for June already! Deadline is this weekend, 15th May, so pop your name up fast! The Marlow Canoe Sprints will be running on 12th June 2016. Club colours should be worn by competitors in races, including sprint regattas, Hasler races, national championships, and are encouraged for other races. Clubs may receive a penalty if a competitor does not wear the right club colours. If you need any racing vests, please speak to Erika. If you would like any club kit (hoodies, jackets, technical T shirts, etc.) please order them from Hawkinsport directly at www.hawkinsport.co.uk/category/reading-canoe-club. 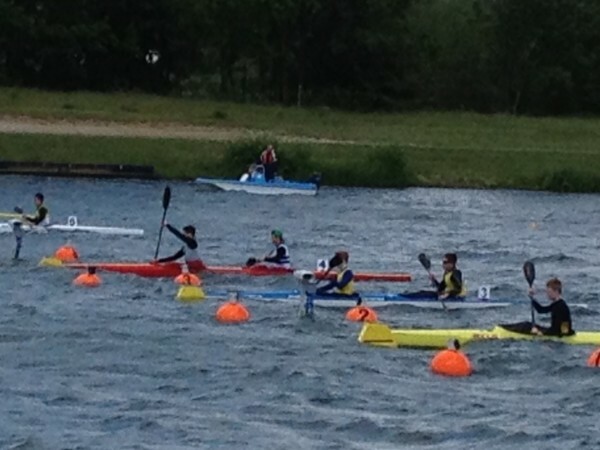 Sixth out of 46 clubs – now that’s not bad going for a team of just 20 paddlers, is it? But then all our competitors were pretty game and most seemed to have put a hand up for every race going – K4, K2 and K1, for all three distances. Perhaps, not quite, but nearly. We had some great results, too – two firsts for Tony M in K1 and by a long way, and two more in K2 with Paul Ralph (naughty Paul – remember, always weigh your boat! ), another for Nigel in his 500m K1 and 3rd in his K2 with Peter M. Vicki and Bethan scored a hard-fought 2nd place in their 1000m K2 and 3rd in their 200m K2 final. 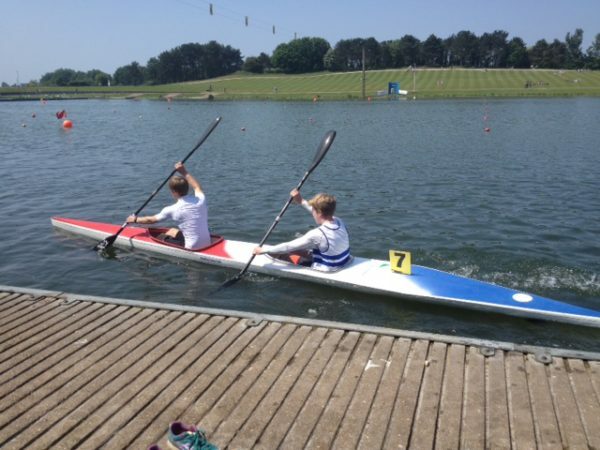 Dan S was 3rd in both his 200m and 1000m K1 finals – amazing when he hadn’t been on the water for 3 weeks! And more 3rd places for Stefan, Laslo and Evan. Erika had to jump into Anita’s K2 for 200m and they raced to 4th place. Tony & Paul ahead of the field. Perhaps the most exciting races to watch were the K4s – both Masters K4 were soooooooo close, on one we reckoned they lost by a mere 3.8cm. Gutting. And the Ladies K4 took an excellent 4th. It was a great weekend … and yes, that was partly down to the weather. How is Vicki L ever going to believe that Nottingham’s National Water Centre is nearly always the coldest, windiest place in the UK when she’s just attended two consecutive regattas and both were sunny and calm! Unheard of. The most enjoyable aspect of the weekend, however, was the number of paddlers from Reading we managed to get up there. That with the great weather meant we could all loiter on the steps, by the finish line, chatting and cheering on our paddlers. Loudly. Roll on next year – let’s get an even bigger team up there and win back the MacGregor Cup! 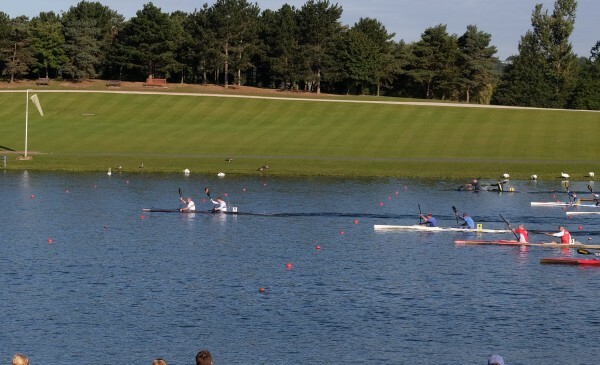 The inter clubs national sprint regatta will be held at Nottingham on 5th & 6th September 2015. Looks like we’ll have a good group of Reading paddlers attending. Please please sign up on the sheet at the club by 5th August. Ah, this was the Regatta we had all been waiting for. Some of us, namely Steph and Fred, because it was the Juniors and U23 National Championship, and the rest of us because of the weather. Yes, for once a no-show for howling head winds; a little breezy and lots of sun Saturday, total calm Sunday. That certainly seemed to play to our Junior paddlers’ strengths; they put on a phenomenal performance. 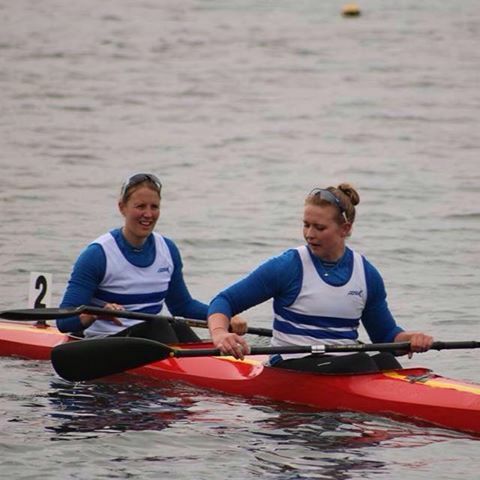 Steph was Final 1 for both her K1 races, 4th in 500m and 5th in 200m, then on the Sunday got in a boat for the first time with Floss from Wiltshire and stormed to 2nd. Fred, too, was on fiery form. Glad to have his usual K2 partner back in the boat, despite his knee injury, he and James swept the board, picking up a hat-trick of National Champions Gold for K2 1000m, 500m and 200m. And for K1 … Fred was National Champion for 200m, and Bronze for 500m. “What happened with the Bronze” was his middle brother’s only comment! Both the 200m performances were particularly strong with the field left well behind. It is his favourite distance after all. 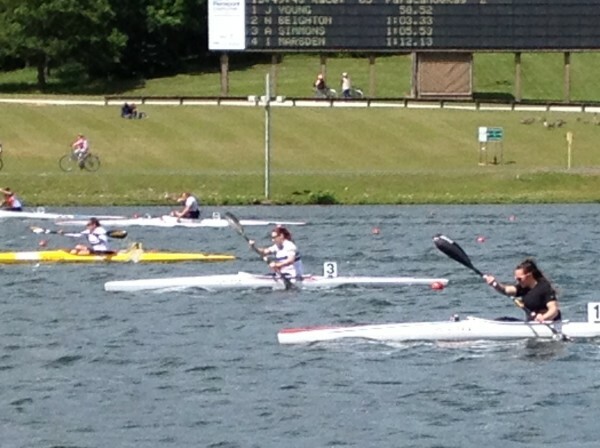 Vicki Lucas bravely took to the course for the first time with very respectable results for all three of her K1 races. Sam Scowen was there, coming 4th in her 200m K1, Plus our other two Sams – Kirschstein and our borrowed Kiwi, Sam Newlands and Radek, too. RCC almost felt like we had a proper posse up there, especially when Immi turned up on Sunday to cheer everyone on! Radek and Sam’s K2 1000m was an impressive 3rd and, for the 5k race, they came 5th and 3rd respectively. See you all up there for Interclubs on 5th/6th September with more of that no-wind-and-lots-of-sunshine! Now there’s windy and there’s super-windy. 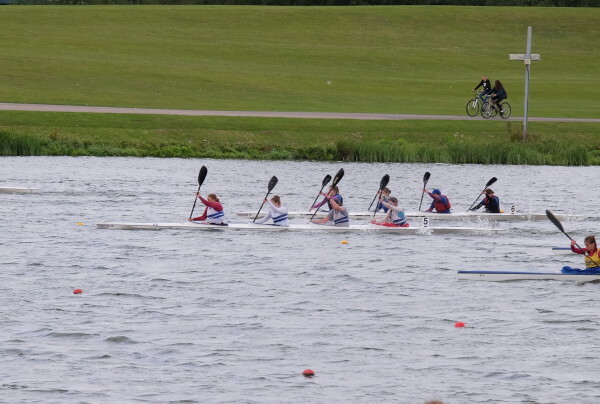 June 6th Nottingham Regatta – now that was diabolically windy, with white horses at 200m, so you can imagine what it was like at 1000m. Horrible. With One Direction playing at Cardiff on 6th, Stephanie and team leader Erika were out of the picture for this one. Sabine stepped back into position. A small sprinkling of paddlers came up – good to have Sam K there, great to have you back on the water and what a storming win (1.43secs in front of the next boat) for you in the Under 23 Olympic Development Squad K4 they asked you stroke. Result! Sam Newlands, our ‘borrowed’ Kiwi paddler, was up there dealing with the English weather. Terrific K2 race with another Kiwi, so close it required a photo finish and they were just edged into 2nd place by .04 of a second. Sam Scowen completed our trio of Sams representing Reading and in her 500m K1 she came a tight third, while Duncan came a very respectable 2nd in his Men’s 200m sprint. 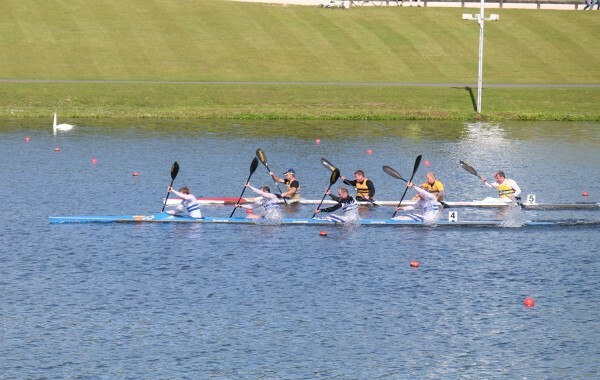 Laslo was up there for Sunday morning – impressive win in Master’s C K1 500m – easy. Surely time they put you up into Men’s B? Fred in Boys C seemed to cope with the horrible wind at 1000m, pacing himself well to get into Final A for K1. A bit disappointed with his usual favourite – K1 200m. But he saved the best to last with his 500m K1 Final B on the Sunday. Explosive start (always), led the field, but by 200m had slipped to 6th. This time, however, he had left plenty in the tank and stormed through to a 1st place. That was soo exciting … but then I am his mum! Hope to see many more of Reading Club members in July. And definitely at Interclubs in September. Remember you need to register by July 5th latest to be permitted to race in September. Ask Erika for details. Thanks to Nikki Jacoby for the report. The sprinters experienced a lovely weekend in Nottingham which ( as you all know) is very rare with gentle tail winds and a beautiful blue sky (well, at least on Sunday). Of course, there was a bit of algae in the water but people were willing to overlook this fact as all other conditions were close to perfect. 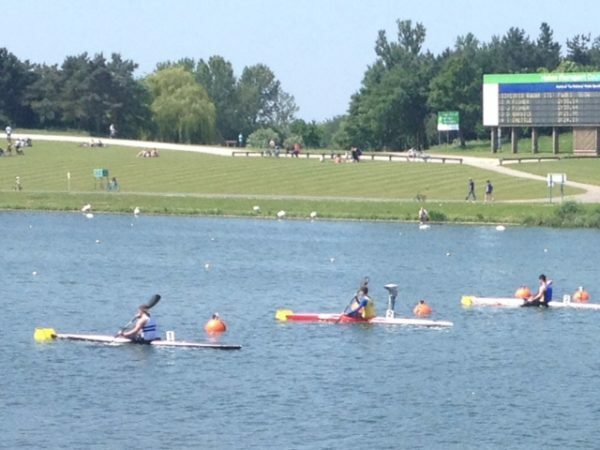 All Reading paddlers did very well in this Regatta but as it was the Junior National Championships I have listed some of the best results below. 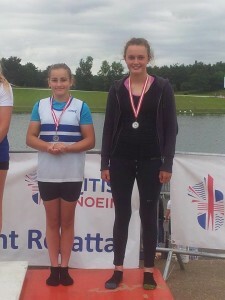 Considering that we only had 5 juniors entering this Regatta we had some fantastic results. We also had a complete newcomer in this Regatta, Laszlo, who joined us on Sunday for the 500m coming second in his Final. Due to lack of interest we regret that we have to cancel tomorrow’s junior regatta.